Shelves of books with their Leather Binding’s look great but you just know that many of the books bindings aren’t really leather. Faux leather book bindings, and artificial leather that we find covering many products are manufactured and marketed under many names, including a name we commonly know, ‘Leatherette’ and of course the faux leather product known as ‘Leatheroid’. LEATHEROID was invented in Wheeling, West Virginia sometime around or before 1879 at the Hanna & Clemmans, (Thompson Hannah, Thomas Hanna, Daniel W. Hanna, and Daniel Clemmans) ‘Fulton Paper Mill’. Leatheroid’s basis was an improvement in the manufacture of “Parchment” paper based on an 1877 patent of Thompson Hanna then of Pittsburgh, Pennsylvania.1 “Parchment” paper (the real thing) was made from untanned animal skin (preferably goat) that produced a material suitable for writing. Pages of the U.S. Constitution, the Declaration of Independence, the Bill of Rights, and the Articles of Confederation were written on Parchment paper. By the mid-1800s, Parchment paper was being made from cellulose and cotton fiber that mimicked the surface of parchment. Wheeling’s Fulton Paper Mill was founded very early (possibly in operation from the early 1820s) by Alexander Armstrong & Co. It was located on the south side of Center Street in Fulton2 (a section of Wheeling) and the mill was powered by water from the nearby Wheeling Creek. Alexander Armstrong & Company’s ‘Fulton Paper Mill’ was seceded to the Spence & Thomas Hanna, paper manufactory in 1872. Alexander Armstrong in his elder years had given up the daily running of the mill, (he died in 1868) and in 1878, the mill came under the ownership of Thomas Hanna and Daniel W. Clemmans doing business as the ‘Fulton Paper Mill’ Hanna & Clemmans Paper Co. The mill was mainly manufacturing newspaper for Wheeling’s thriving newspaper business. Hanna was experimenting with his patented ‘Parchment’ paper using different chemical solutions and modifications to some of the mills equipment, the result being the development of ‘Leatheroid’. George Knox3 an employee of the company is credited with many of the new ideas used in this process. ‘Leatheroid’ (imitation leather, the vinyl of its day) was prepared by using unsized cotton paper that would allow the fiber to be vulcanized in a process using mineral acid. The Fulton Paper Mill company manufactured and advertised their patented ‘LEATHEROID’ paper as being manufactured by their subsidiary company, the ‘Leatheroid Manufacturing Co.’, shipping it throughout America and Europe. The ‘Leatheroid’ Manufacturing Company’s first existence can be traced to Wheeling, West Virginia in 1879.4 The State of West Virginia’s 1879 Session Laws named the following individuals holding shares, and the number of shares they owned.5 Thompson Hanna owned 125 shares, Thomas S. Hanna 25 shares, Charles E. Dwight 25 shares, Daniel Clemmans 25 shares, and Daniel W. Hanna 1 share. Shares were valued at $100.00 each. 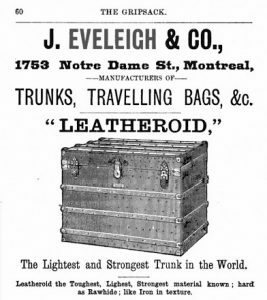 Leatheroid (imitation leather) was advertised as being particularly adapted to the construction of carriages, railroad cars, chair seats, trunks, etcetera and etcetera. America’s railroads quickly picked-up on the new ‘Leatheroid’ product, had it molded into wall panels and fitted it into their luxuriously appointed railcars. Soon, Wheeling homes were installing ‘Leatheroid’ as wainscoting on their walls, and some of this ‘Leatheroid’ wainscoting can yet be found in many old Wheeling homes. Leatheroid really does look like real leather, and it was sold as a leather product. One difference, ‘Leatheroid’ can be ‘design molded’, real leather cannot. Here we see an 1888 Gripsack catalog advertisement J. Eveleigh & Co. Montreal, Canada and a Leatheroid Manufacturing Company ‘Leatheroid’ advertisement from “Historic New England org”. In 1807-1808, Alexander Armstrong 1785-1868 published the Wheeling Repository, Wheeling’s first newspaper. Mr. Armstrong had a small printing press next to his home on the west side of Main Street in Wheeling. This newspaper was a sort of weekly literary magazine of about eight pages, about eight by twelve inches in size. Armstrong’s paper was manufactured in a small paper mill inside a Wheeling built river barge that he had moored to the riverbank behind his residence just above Beymer’s Landing at what would then be the foot of Jefferson (Ninth) Street, and today would be under Wheeling’s I-70 ‘Fort Henry’ Bridge. Attached to the barge was a paddlewheel that in-turn, powered a cam-hammer setup inside the barge. The cam-hammer setup hammered old rags, (rags cut into small pieces that were soaked in a large water filled vat) into pulp. 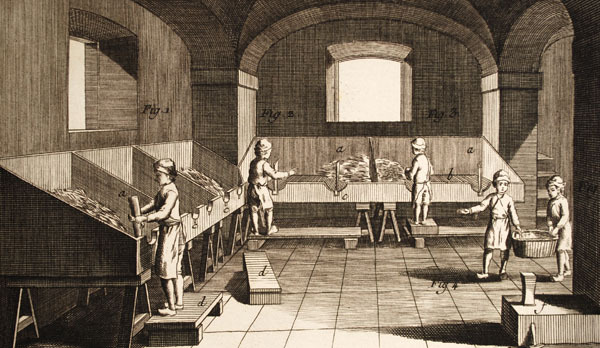 In essence, this was and is the beginning of papermaking. Figure 3. Cutting rags into smaller pieces and removing buttons, pins, and other foreign matter. Figure 8. 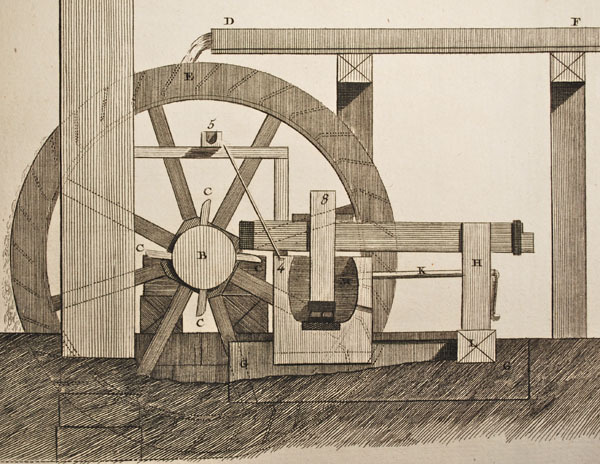 Encyclopédie stampers; cut-away side view. Evidently, early Wheeling didn’t find a great need to read news as no newspaper was published from 1808 to 1820. Starting in 1820, Rob Curtis published the Virginia North Western Gazette, a Saturday edition. In 1821, it was known as the Wheeling Gazette, (Curtis, R.I., Publisher) a weekly and semi-weekly with office and plant on Monroe (Twelfth) Street. In 1826, (McCreary, John M.) was his successor at 86 Main Street, corner of Monroe Street. The paper became the Wheeling Daily Gazette in the 1840s, published by James E. Wharton, and others followed. Armstrong’s ‘Fulton Paper Mill’ furnished the newspaper. A Fulton Paper Mills “Letter Head” from John Bowman’s collection. In 1878, the Fulton Paper Mills advertised they shipped a superior grade of strong ‘Tea’ paper throughout this area and the adjoining states into 1889-1890s. Finding nowhere a paper made that was actually ‘Tea’ paper as advertised above, there was found however an engineering description of the mechanical behavior of paper when subjected to tensile stresses as they are pulled to failure, and this is known as tensile energy absorption ‘TEA’, the breaking strength of paper, perhaps? In 1826, William Lambdin erected a mill on land owned by William Chapline on Twenty-Third Street from Water to Main Streets in South (Centre) Wheeling. The Virginia Paper Mill operated for ten years and burned in 1836. At this time, the old Cotton Factory at 49 Water Street ran by Marcus Wilson and Henry Echols had failed and was in the process of being turned into a paper mill. Lambdin and his son purchased the mill and continued the paper milling business into 1858. William Lambdin and Son also ran a dry goods and grocery store at the same address. In 1858, Daniel Cushing a partner with a Mr. Ayers in an oilcloth factory purchased the mill and ran it to 1861. The Point Paper Mill of A. & R. Fisher at 10 South Street on the point above Wheeling Creek was erected in 1837, which they ran into the mid-1840s. The two were proprietors of a blacksmith, wagon and plough making business at the same address. Robinson, A.G. & Co., paper manufacturers at 323 Water Street, Wheeling, Virginia in 1853. Joshua McCracken was a paper maker at 33 Water Street, Wheeling, Virginia in the 1850s. Daniel Cushing and Mr. Osbun turned the old Ayres & Cushing, oilcloth factory, established in 1855 on Webster (Twentieth) Street, located on the south side of Wheeling Creek into a paper manufactory in 1858. They advertised they manufactured “Black and Fancy Colored Leather Cloth”, “Plain and Enamelled”, (this was probably oilcloth) and “Also, Green Transparent Window Cloth”. Along with oilcloth, they made straw paper and straw board for bonnet boxes into the 1870s. What about this oilcloth? Oilcloth aka Enameled Cloth was made using a boiled linseed oil treatment on cotton or linen cloth, which gave the cloth a water-resistant surface. Oilcloth tablecloths were popular in America into the late 1950s. Straw board was a thick and coarse paper fabric of yellow paper or cardboard made of straw largely used by manufacturers of cheap paper boxes used in Wheeling’s Stogie trade. “Green Transparent Window Cloth”; a window shade? In Wheeling’s early 1700 homes, ‘Log’ homes built before there was window glass, builders used paper greased with animal fat for window openings, which made it both translucent and waterproof. This author once noticed an old farm building with a window opening that had greased paper. It was just a cheap way to make a see through window. Two Centre Wheeling, Virginia paper mills were listed in 1858, the Bassett & Co., paper manufacturer corner of Water and Mill Alley in South (Centre) Wheeling and the Phoenix Paper Mill, corner Water and Second Streets in South (Centre) Wheeling. 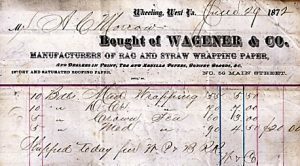 In 1859, we find the D. Wagener & Co. wholesale paper warehouse at 22 Main Street with an outlet at 1505 Main and 1506 South Streets, Wheeling, Virginia. 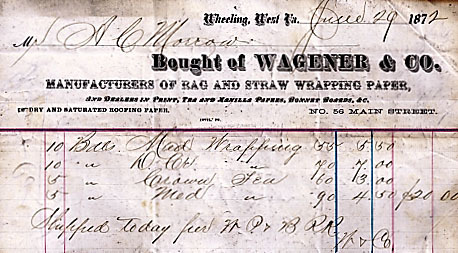 In 1872, Wagener & Co. was listed as a manufacturer of Rag and Straw Wrapping Paper, and a dealers in Print, Tea and Manila Papers, Bonnet Boards etc., and Dry or Saturated Roofing Paper at 56 Main Street, Wheeling, W. Va.7 Manila and Hemp scraps from Wheeling’s Rope making business went into papermaking. Manila paper was highly valued for its high strength and durability. Wagener & Company “Bill of Lading” from John Bowman’s collection. The R.G. Jordan & Co., paper manufactory and the Star Paper Mill in West Wheeling, Ohio supplied the Wagener Company from 1859 to 1880. James Jepson & Co., paper manufacturers at 1321 Main Streets, Wheeling was listed in 1889. The Hanna & Clemmans ‘Fulton Paper Mills’ having been Wheeling’s first paper mill would be Wheeling’s final paper manufacturing business lasting well into the 1890s. Leatheroid – A new chemical product has just been brought out at Wheeling, West Virginia under the name of Leatheroid. This name was selected by its inventors on account of its resemblance to leather. It is made of two varieties, one being soft and flexible like leather, the other hard like Gutta-percha (natural latex produced from the sap of trees) or vulcanized rubber resembling those materials in its density strength and hardness and like them is susceptible of a very high polish. The Leatheroid is manufactured from vegetable fiber by a chemical process, which is patented. It is made in sheets of 12 feet in length by 4 feet in width and can be made of any desired thickness from one-hundredth of an inch to one inch. The Leatheroid has been thoroughly tested as a substitute for leather in the manufacture of trunks and washers, for Gutta-percha in combs, napkin rings, etc. For tin and iron in roving cans and bobbin boxes for cotton mills, for whalebone in whips, for copper in shoe tips, for wood in chair seats, and also used in the manufacture of friction pulleys. For machinery cams and in fact there seems to be no end to the use to which it can be applied. Leatheroid can be made of any color though it is usually made brick red to imitate leather or vulcanized rubber. Black, which is used in the manufacture of combs and canes, and walnut, which is used in chair seats. One of the great advantages claimed for Leatheroid is that it is cheaper and better than any of the materials, which it is intended to replace. 2 Fulton, the town of: It is not known whether the name ‘Fulton’ was given by the owner of the paper mills there (a Mr. Armstrong) or Judge Thompson who was a congressional representative who later argued the case against Pittsburgh’s attempt to take down the Wheeling Suspension Bridge. But, the town was named for Robert Fulton, the designer of the steamboat who powered it up the Hudson River in 1807. 3 George Knox, Knox Lane in the Leatherwood area of Wheeling incorporated in 1868. 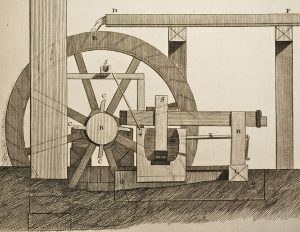 4 Source: Newton, J.H. Editor, Nichols, G.G., Sprankle, A.G. History of the Pan-Handle, Being Historical Collections of the Counties of Ohio, Brooke, Marshall and Hancock, West Virginia J.A. Caldwell, Wheeling, W.Va. 1879, pages 288, 289. 5 Source: Acts of the Legislature of West Virginia at its Fourteenth Session Commencing January 8th 1879; Published by W.J. Johnston Public Printer; Wheeling, West Virginia; 1879 page 248. The West Virginia law incorporated the company with $20,200.00 in initial capitalization, each share having a $100 value. The company was authorized to increase its capitalization to $100,000 through the sale of additional shares with the value of $100 each. 11888 Gripsack catalog advertisement J. Eveleigh & Co. Montreal, Canada. 2 Leatheroid Manufacturing Company ‘Leatheroid’ advertisement from “Historic New England org”. 3 Figure 3. Cutting rags into smaller pieces and removing buttons, pins, and other foreign matter. 4 Figure 8. Encyclopédie stampers; cut-away side view. Pictures Used Credits: University of Iowa “Paper Through Time”. 6 A Fulton Paper Mills “Letter Head” from John Bowman’s collection. 7 A Cushing & Osbun “Letter Head” from John Bowman’s collection. 8 D. Wagener & Company “Bill of Lading” from John Bowman’s collection. 1 Bowman, John, Bills of Lading Freight On Board Wheeling, W. Va. Wheeling, WV 2012. 2 Newton, J.H. Editor, Nichols, G.G., Sprankle, A.G. History of the Pan-Handle, Being Historical Collections of the Counties of Ohio, Brooke, Marshall and Hancock, West Virginia J.A. Caldwell, Wheeling, W.Va. 1879 Reprint Heritage Books, Inc. Bowie, MD 1990. Great article! Any chance that Leatherwood was so named because of Leatheroid? Thanks Mike. I wondered that too, it is possible maybe probable, but in my research, I did not find anything documenting that.